Common Name: Gardenia fruit, Capejasmine fruit. Part Used & Method for Pharmaceutical Preparations: The fruit is gathered in autumn or winter when it is ripe. Either the raw herb or the carbonized herb is used. Meridians: Heart, liver, lung, stomach and triple jiao. 1. Febrile diseases manifested as high fever, irritability, delirium and loss of consciousness. 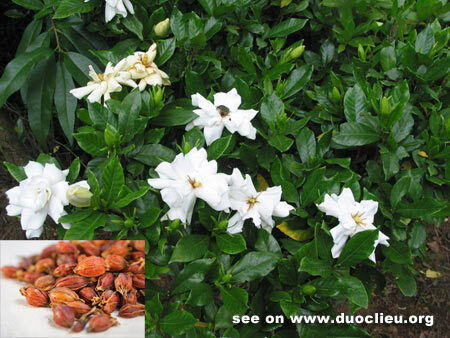 Capejasmine (Zhizi) is used with Prepared soybean (Douchi), Forsythia fruit (Lianqiao) and Scutellaria root (Huangqin). 2. Jaundice with fever and dysuria. Capejasmine (Zhizi) is used with Oriental wormwood (Yinchenhao), Rhubarb (Dahuang) and Phellodendron bark (Huangbai). 3. Extravasation caused by heat in the blood manifested as vomiting blood, epistaxis and hematuria. Capejasmine (Zhizi) is used with Imperata rhizome (Baimaogen), Fresh rehmannia root (Shengdihuang) and Scutellaria root (Huangqin). 4. Boils and carbuncles. Capejasmine (Zhizi) is used with Coptis root (Huanglian), Scutellaria root (Huangqin) and Honeysuckle flower (Jinyinhua). Cautions & Contraindications: The herb is contraindicated in cases with weakness of the spleen and diarrhea.